Description : Situated in the heart of the city, there are many tourists that come here often. I enjoyed the nature view and thought it was the perfect place to stroll alone with my thoughts. The park was well kept and had many visitors. It was like heaven to laze around freely after the rigmarole of my busy schedules. As we continued our trip to Hyderabad it was time for some cooling off. The temperatures are high in Hyderabad for most parts of the year and as a recluse during the summers the last Nizam of Hyderabad Osman Ali used to go to the Osman Sagar. The Osman Sagar was constructed in the year 1920. It is a lake created out of damming the river Musi. The Osman Sagar was developed as a summer recluse for the Nizam but also served the purposes of a water reservoir during dry spells. It also protected Hyderabad against the great flooding of river Musi in the year 1908. The river Musi does not flow with its past glory now and its falling levels are a sign of concern for the city of Hyderabad which so badly depends on it for its drinking water needs. The Osman Sagar Dam has been developed as a summer resort for the general public after it became irrelevant towards fulfilling drinking water needs of an expanding Hyderabad. The city of Hyderabad is now overly populated and a dam like Osman Sagar cannot serve the purposes that it was built for. It now serves as a recreational center and provides occupation to hundreds of citizens. We booked the Osman Sagar Resort way in advance because the resort does not have a large number of rooms and is occupied and pre-booked for most parts of the year. It is thus essential to book it is advance, so that you can have a comfortable stay. The best booking time is during the winters because the rush is the least. Also you can witness a drop in prices then. The stay at Osman Sagar Summer Resort is a budget deal if you do so with friends. The rooms do not cost much but the services are impeccable. The scenic beauty around the Osman Sagar is just outpouring. This was the reason that even Nizams could not resist coming back to this place again and again during the summer heat of Hyderabad. The Osman Sagar is quickly becoming a major tourist attraction in the region. Description : The smell of Biriyani brings me here always. Hyderabadi biriyani is world famous of course ! It is a multi community place; here you will find different kinds of amazing and fun loving people. One day during my visit to the city, I happened to check out Golkonda Resorts and Spa. Beautiful, calm, natural surroundings and ultra special services! What more can one wish for with such a heavenly service! Aaah! Peaceful! Ramoji Film City Hyderabad : There are many places in our country which can lighten our moods. Hyderabad is a fun place, and I took my friend here after she had a break up (Sadly ). Ramoji film city in Hyderabad is such a place that will thrill you! The entire place is vast with numerous sets including parks, monuments, station, airport, colonies and many more. Yippee, I made her happy as no one can stay depressed in such surroundings! Chowmahalla Palace Hyderabad : It was necessary to have a guide along to explain each and every vintage piece of information. The backyard of this exquisite palace was my favorite. It was lavish and extremely beautiful. The architecture was commendable and the artifacts were maintained properly. The souvenir shop allowed me to buy a small memory of this palace as well! So I begin a journey to Hyderabad, Telangana. I am a Pharmacist by profession and hence I am generally busy with my job but whenever I have time I like to express myself. Travelling is a way of expression for me. The places people travel to speak volumes about their nature and the kind of people they are. It is often the case that the most outspoken people intend to visit the calmest and most peaceful places to come in unison with them. I am an expressive person. For me travelling is about breaking free from the simplicities of daily life. After all what is life if we can’t find some leisurely time to spent with our friends? I do not believe in inactivity but I cannot do a particular thing for long hours. I am always in search for something new. This search for excitement takes me to the state of Telangana. It is the newest state of India, the 29th and I decided to visit its capital Hyderabad which is often referred to as Secunderabad. I booked a ticket in Rajadhani Express running in Bangalore Hyderabad route. I caught the Rajdhani Express running in Bangalore Hyderabad Route which is the quickest and most comfortable train on the Bangalore Secunderabad route. The train departed from the Bangalore Railway station at 10:20 in the night and reached the Secunderabad Railway station at 7:30 in the morning on the following day. The city of Hyderabad welcomed me with an open sky and weather just perfect for a long and satisfying trip. The trip will last around 15 days and in these days I in tend to travel across the entire city which is I know an uphill task. The city was also the capital of undivided Andhra Pradesh and is among the oldest cities of India. It was ruled by the Nawabs for around 1200 years and an influence of their culture and traditions is quite evident on the city, not only on its architecture but also on its food. The Hyderabadi Cuisine is in itself and entire branch of Indian Cuisine which takes years of leaning to gain expertise. 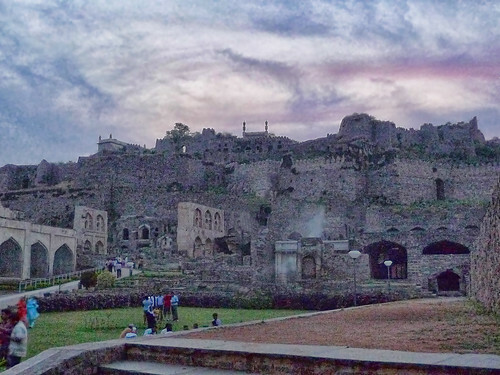 Golconda Fort is among the most important monuments in the state of Telangana. As the state starts to stand on its feet after division, tourism is extremely important for its development. 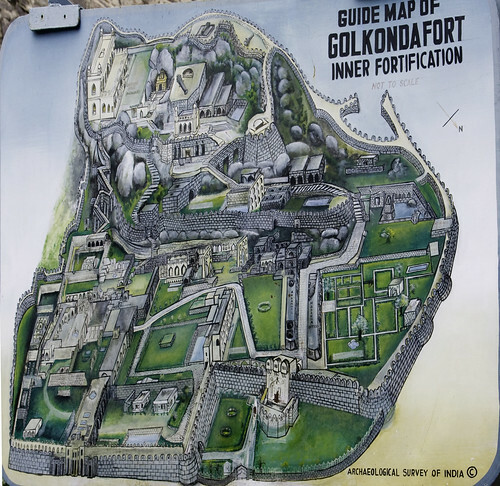 The state government has realised this and has offered a lot of support to the authorities to develop the Golconda Fort as a world class tourism destination. The Fort is already a UNESCO world heritage site and needs no introduction but as I entered into the vicinity of the fort I realised that there was a sense of urgency regarding the development of the monument. It has been well preserved but there exists lot of scope for developing tourist friendly facilities in the vicinity of the fort. The Golconda Fort was seized and ruined by the Mughal emperor Aurangzeb ending an undefeated journey of 1000 years for the fort. The fort was built around 968 CE and since then was the major settlement and administrative headquarters for the Sultanate. The Golconda Fort now only exists in ruins and has been preserved and reconstructed only partly because of its large structure. It is not easy to maintain but successive governments have tried hard to preserve it. The Golconda region is also famed for its magnificent diamonds. The Golconda fort vaults in their prime were filled with precious diamonds like the Kohinoor and the Darya-e-Noor. These diamonds weighed close to 185 carats and still are the biggest in the world. The Darya-e-Noor now sit on the Iran’s Royal Crown and the Kohinoor was stolen by the British. These diamonds have number of mysterious tales associated with them. The Darya-e-Noor weighs around 185 carats and is ruby red in colour. Being a woman I am just mesmerized by diamonds. The diamonds of Golconda have been recognised around the world as the best in the world and are categorised as Type 2A Golconda Diamonds. They get their unique colour from being produced in nitrogen less environments. Their real worth can only be estimated. I along with my friends dreamt of owning one of those magnificent jewels. I'm really happy about this travel venture. We had a great travel experince all thanks to mobile travel app.